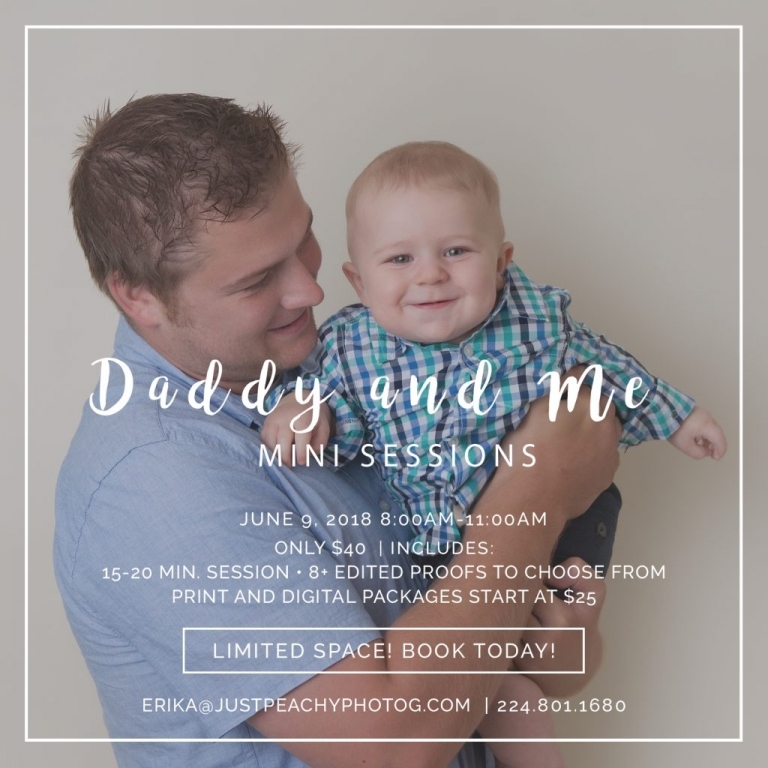 After our super adorable Mommy and Me Mini Sessions on April 28th, we had several requests for a Daddy and Me Mini Session event! I hope all of the Mommas are loving their portraits with their babies! This was an event that was dear to my heart and I just loved every moment providing all of the Moms and Grandmas with photos with their children/grandchildren. I even added an additional 2 hours to the event to fit everyone in that was interested. After years of no interest in Daddy and Me Mini Sessions, I’m trying this one again! What could be a BETTER Father’s Day gift for Dad? I’m sure he already has his share of magazine subscriptions, grilling equipment, sporting event tickets (well maybe not that one), and so many other “things”. What he needs is some beautiful professional portraits with his babies (or Grandpa with his grandbabies)! This is something that will last forever (if you PRINT)! As your children grow, they will have more confidence and feel more loved by seeing themselves with their parents. So what are you waiting for? Sign up below! Daddy and Me Mini Sessions will be scheduled on Saturday, June 9th from 8-11:00AM and will be 15-20 minute sessions. The Daddy and Me portrait mini sessions are for children of any age and their father or grandfather (or bring both). Each session time includes up to 3 children. There will be an additional $15 fee for each additional child. Please note that the children MUST be in your immediate family and not extended family (no cousins or friends for this event–siblings only). The backdrop will be a solid dark gray color to match our Mommy and Me mini sessions this year. The Daddy and Me Portrait Mini Sessions are $40 and includes a 15-20 minute session with the Daddy and Me Mini Session set up only. Session fee DOES NOT include any prints or digital files. Digital files and print packages will start at $25. Please contact the studio for a full pricing list for this special event. You do not have to choose your package until after you receive your proofs but please note the minimum amount you will spend for this event is $25 (after your session fee is paid). In order to book your session, you must sign a portrait agreement and provide a nonrefundable $40 payment. Your space is not officially booked until these 2 items have been received by Just Peachy Photography (you will have 48 hours to return payment and portrait agreement due to limited availability). Proofs will be sent to all participants within 5-7 days of the event so that you can receive your images in a timely manner. If there is an interest, we may add additional sessions past the 11am end time. If you cannot make it to your session, you may get someone else to take your place. Deposits are nonrefundable due to the nature of the event and limited spaces. Once you have contacted us with your preferred time, I’ll email you a link for the contract. The payment can be made online after the contract has been submitted. Thank you! ***No Just Peachy Photography client “credits” can be used for this event until after the $40 payment has been received. Please contact Erika at Erika@justpeachyphotog.com OR 224-801-1680 for more details! CLICK BELOW ON THE GRAPHIC TO BOOK YOUR SESSION! I normally post favorites from the previous year but since this is the first one we are doing I cannot do that! I do look forward to posting next year and making it an annual event for the Dads!